Will you choose an empire looking to enforce world order and unity, or a collection of city-states looking to return to their prior glory? That's the basic rundown of the two Bless Online factions, as the devs have shared a lore-centric post detailing the history of the two sides and their current conflict. 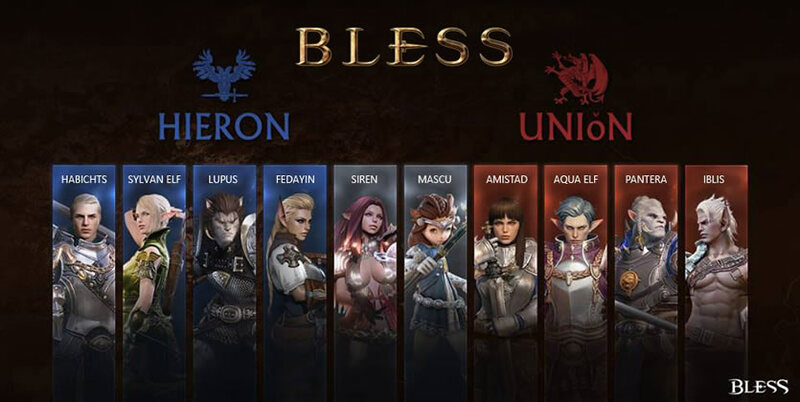 The world of Bless Online is pretty much cut in half, so to speak, with the Hieron Empire to the north and the Union Alliance to the south. The Hieron Empire traces its history back to the Habicht Empire, which drove away marauding barbarians and reclaimed territory. Members of this alliance are considered to be more conservative and believe in enforcing order. The Union Alliance, meanwhile, is made up of city-states that were part of the lands liberated by the Habicht Empire. However, the Union Alliance wants independence and has managed to rally enough people to take back several territories in the southern continent. According to the post, the differences in worldview, politics and morals have led to the inevitable war that will set the scene fro Bless Online's PvP activities. The post also promises that players on either faction will experience their own unique stories, with Hieron players facing events that "cause you to think about what really makes a true emperor" and Union players getting the opportunity to "challenge for supremacy in the new age." Well, considering that PvP is going to be a thing in Bless Online, we suppose it was only inevitable that there would be some deep-seeded sour feelings between the two sides. Which of the two factions are you most interested in? Or do you think that faction-specific PvP warfare is too boring? What Class You Guys Will Play Bless Online?